I grew up in the Midwest spending most of my time in Iowa City, Iowa. As a kid I was always very active. My sister and I spent as much time as possible outside, building forts, riding bikes, running around the neighborhood, and playing pretty much every sport available. After trying out gymnastics, soccer, baseball, basketball, and football, I settled on wrestling which was very popular in my home town. When I was in high school I got to be around and was influenced by the legendary wrestling coach Dan Gable of the University of Iowa. I had the opportunity to train in the Hawkeye wrestling room as often as I wanted, and spent as much time there as I could. Every day I was able to learn from some of the top coaches and athletes in the world. For me, wrestling became a year round sport and a way of life. Besides the winter season, in the spring and fall I would train in the Iowa wrestling room, and in the summer I would wrestle in freestyle tournaments and attend intensive training camps. I was able to learn about mental toughness and mental preparation, being competitive, leadership, and going above and beyond to reach and exceed my potential. After high school, I attended Wartburg College in Waverly, Iowa where I wrestled my first two years. We won the Division III National Championship both years. During the summers I coached at two different kids wrestling camps in Iowa City for my former high school coach. I enjoyed working with the kids who, like me, wanted to go above and beyond what the average person was doing to get better at my sport. I also had the opportunity to participate in filming a video for Nike on rules and technique. Since college, I have spent a lot of time learning about personal performance. I have attended many seminars and events about leadership, goal setting, and achievement. I have always run my own business and spent a lot of time teaching and training others in the business setting. I was introduced to CrossFit by my wife Tiffany and began training in July of 2009. Tiffany had been doing CrossFit for almost a year and coaching for almost four months before I set foot in the gym to workout. She had suggested I get started earlier but my pride and ego kicked in and told me that I needed to “get into shape” before starting CrossFit. Finally I took the plunge and was hooked instantly. 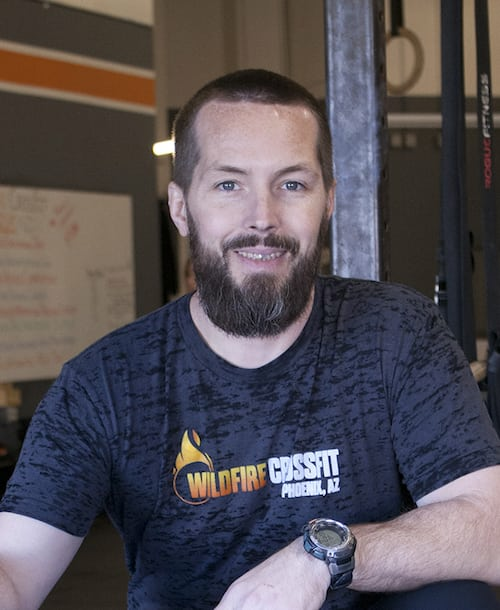 I spent as much time in and around the gym as I possibly could, and I was very enthusiastic about the positive changes CrossFit was having on our way of life as a couple. The new healthy lifestyle was a perfect fit. After several months of training and helping out around the gym I began to look into coaching. It was something I had always wanted to do, and had always been told I would be good at, but just needed the right opportunity. In December of 2009 I earned my CrossFit Level 1 Certification and started helping out coaching classes. I have had the opportunity to learn from some of the best athletes and coaches in the world both in wrestling and in CrossFit. Just like when I wrestled in high school, CrossFit has become a way of life. Every day, I have the opportunity to work with people who are truly interested in improving their lives through fitness. It is that passion that attracted me to CrossFit in the first place, and being around people who are truly inspiring makes coaching a passion and a way of life. My wife, Tiffany, and I are now in our 6th year of owning, operating, and coaching at WildFire CrossFit. I am lucky to say that I love what I do! I get to help people move better, feel better, and be a part of a diverse community where people have the common interest of living positive and healthy lifestyles through fitness and nutrition. The last 5 years have been a blast and I can’t wait to see what the next 5 brings!